No matter how many times I remind myself that the sweet potato and the yam are not the same tuber, I still hesitate when asked to explain the difference. It's a problem of nomenclature: Nearly all of the "yams" that we come across in North American markets are actually sweet potatoes. And sweet potatoes aren't related to potatoes. Confused? The sweet potato is a New World native, its popularity spread by Columbus. True yams, on the other hand, are giant tubers that originated in Africa thousands of years ago; they aren't commonly available here. The plants belong to different botanical families, but they do share some physical and flavor similarities. Today we tend to think of "the orange ones" as yams and "the white ones" as sweet potatoes, when they are both simply different varieties of sweet potato. Currently, China grows more sweet potatoes than any other nation. Most of the Chinese crop is exported or sold as feed; because of this livestock connection, sweet potatoes were traditionally consumed by society's poorest. War-induced famine also kept the Asian variety of the sweet potato hidden in homes. During the fall and winter months in Japan, bakeries mix them with sugar, cream, and eggs to make sweet cakes and pies. Street vendors also offer them, steamed simply in their casings, to fight the chill of cold winter days. I recently came across some Japanese sweet potatoes at my local farmers' market and was curious to see how they differed from the usual American sweet potatoes. Not to be confused with purple-fleshed Okinawan sweet potatoes, these were the white-fleshed Satsuma-imo variety. Since they looked very similar to our common red-skinned sweet potato, it wasn’t until I began peeling them at home that I noticed the difference. Once exposed to the air, Japanese sweet potatoes quickly begin to turn brown. With a bowl of cold water at hand, I swiftly sliced and immersed them. They were also incredibly starchy and dry. Stateside, Japanese sweet potatoes are a fleeting fall crop, so grab some when you see them. If you like their delicate, sweet taste, go back for more and store them loose in a cool drawer or cupboard for up to a few weeks. For mashing, I found that roasting them dried them out too much. A quick steam in the microwave was a faster and tastier alternative. Better yet, peel, cube, and simmer them in water like you would russets. Or fry them, per Mark Bittman's suggestion. 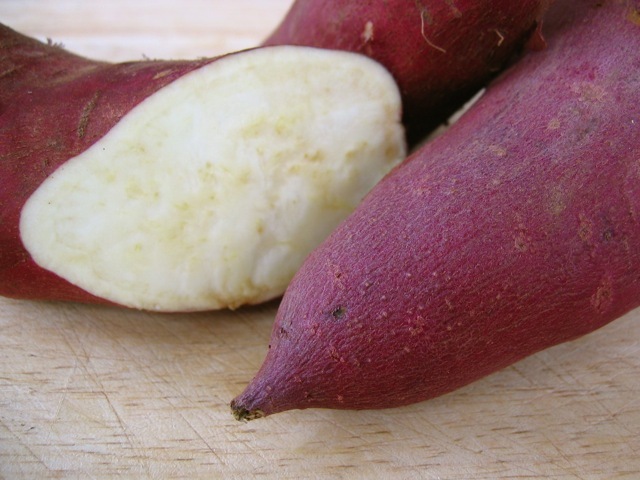 Substituting Japanese sweet potatoes for common sweet potatoes is possible, but you might need to add a little more liquid in recipes. Their dry nature and mild chestnut flavor make them a popular substitute for chestnut purée. In our house, we ate them mashed, au gratin, and roasted. My teenage son's favorite preparation, however, was as Japanese sweet-potato chips.